Girrrl! this ain’t the season for shaky investments! When it comes to relationships of any kind an investment is always taking place. Be it family, friendships, mentorships, and romantic relationships someone is always investing. What are some things you invest as it relates to people? Your time, mind, conversation, resources, and overall energy. The investment is inevitable so the main question is, how profitable is the investment, what is your ROI = Return On Investment (oh my - those Howard University girls!)? It may sound harsh to refer to people in terms of profitability but the reality is if you are living your life on purpose, there is little room for shaky investments. So what does a shaky investment look like in the perspective of relationships? Are you the one doing all the calling? Do you guys only talk because you reached out? Girrrl, that investment is shaky! One thing is for certain, if a man is interested, he WILL call you; he will reach out. Because he’s interested, he will want to speak to you as this is the main way to get to know someone better. Some may disagree here but texting is not the same as calling, just my opinion. Particularly for people of a certain age (35+), constant text communication is not how real, genuine communication should shake out. (I’ll be the first to admit I’m a chronic text person and I need to do better!) The point here is, as it relates to people, investment should take place on both sides and when it doesn’t, it’s shaky. Shaky investments always leave you wondering. Always wondering where you stand in said ‘relationship’? Never quite sure who you are to this man? Forever asking ‘where is this going?’ Girrrl run! This is a shaky investment that will not yield a positive ROI. 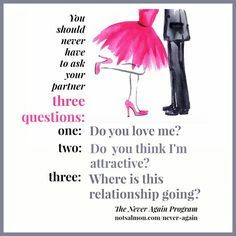 When two people are working together to build a loving, fruitful, solid relationship, these type questions will never arise. Why? Because you would have already discussed it! I’ll make an exception for my teenage young men and those in their 20’s. At that stage they are still maturing and growing up and things may not be so clear then (not all but many). But for men of a certain age, you should not be walking around wondering what are y'all doing! Where dey do dat at? A conversation needs to take place about the progression of the friendship or relationship even. Keep in mind, everyone that enters your life may not serve a romantic purpose, relationships comes in many flavors. But communicating with one another makes the purpose of the friendship clear and the direction even clearer. Whenever you invest in someone and you do not get anything positive in return depletion takes place. It only stands to reason that you would feel depleted after you have poured out and into someone only to receive nothing in return. Or perhaps you do receive some things in return - you get dissed: i.e. disrespected, disregarded, dismissed, (unnecessary) disagreements, disappearing (acts), disappointed, discombobulated, disconcerted, disarrayed, discarded, I could go on but I won’t. The one dis that would dismantle all of these is discernment! Girrrl pray to the Most High and get some!! Recognize shaky investments early to avoid the heartache and headache that comes with them! I want to see you soar and live victoriously on purpose! Be mindful of your investments! Girrrl! That was so good. And please hurry up with part 2. I need some self-assessment.